The YIVO Encyclopedia of Jews in Eastern Europe includes a lengthy article on Jewish music, which one would expect for a topic that is so closely associated with Jewish culture and history in the region. But the Encyclopedia notes that until the late 19th century, no significant amount of Jewish music was transcribed and little else was written about it in useful forms, so “we know next to nothing about what how music sounded throughout 1,000 years of Ashkenazic history in the region.”  By the beginning of the 20th century, and under the influence of other contemporary Western and Central European cultures, Jewish music blossomed in all areas of life: in daily and weekly chants and sung prayers in both domestic and public religious service; in instrumental concert music from weddings to popular recordings to classical conservatory work; and in a wide variety of popular folk music, both vocal and instrumental. [is] also singing Eli, Eli, the ever popular Yiddish theater hit that was practically an anthem one hundred years ago. Wunderkind cantors were not uncommon. Among the most famous was Moses Mirsky, who moved to London and became one of the most respected voice teachers at one of the big conservatories there. Alto boys were really beloved because when they grew up they became tenors, and duets between the cantor and an alto soloist were very common. So Rohatyn was not completely off the map of Jewish religious music in the early 20th century. The Faust Family Klezmorim at upper left on page 20 of the 07Oct1923 edition of The Jewish Daily Forward, a Yiddish/English newspaper published in the US. The fame of the Faust Family Klezmorim lived on long after they and the Jewish community they entertained disappeared from Rohatyn. 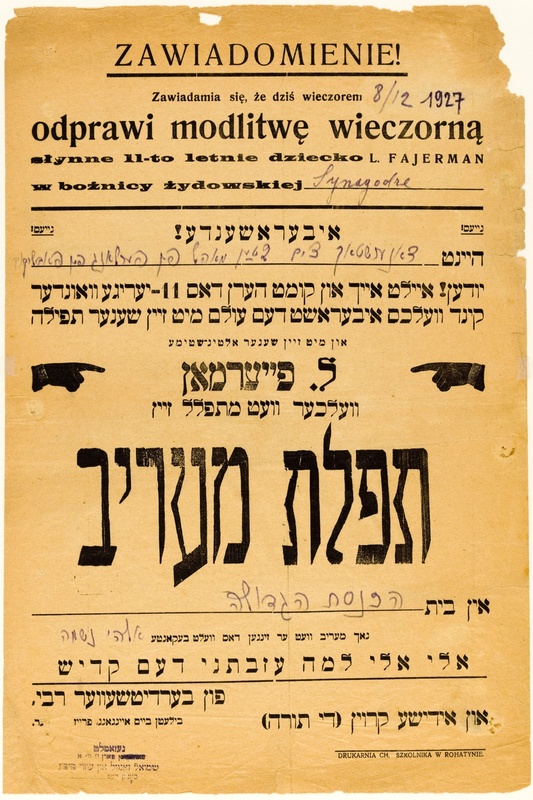 In 1981, the American world-music publishing company Folkways Records (founded and managed by Moses Asch, a Warsaw-born Polish Jew) produced an album of recordings from the YIVO archives called Klezmer Music 1910-1942 [FSS 34021] featuring on the cover… the Faust band photo. And they appeared in the liner notes inside as well, with additional information about the composition of the band and highlighting the contrast between traditional and modernist instruments and dress among the players. Unfortunately the recording features no tunes played by the Faust family, and no other recordings by the musical Rohatyners are known to exist. 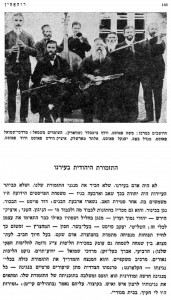 So what was (and is) this klezmer music that was so celebrated in Rohatyn, in the region, and throughout Galicia and interwar Poland? YIVO reports that the term klezmer (pl., klezmorim), referring to both the musician and the style of music, comes from the words kele zemer, meaning musical instruments or vessels of song, and was thus originally related to instrumental music. 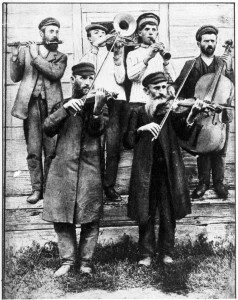 Normally the klezmorim played without vocal accompaniment, except at weddings where they provided instrumentation to the rhymes of the badkhn (a kind of bard or jester to amuse the guests). After World War I, klezmorim were increasingly integrated into various forms of European musical life, even as they maintained a role in Jewish communal music. 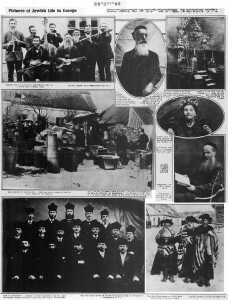 Within Jewish society, the main venue for klezmer bands and the primary opportunity for performance and for paying work was the wedding. Apart from weddings, klezmorim performed on holidays such as Hanukkah, Purim, and sometimes on Sukkot, Passover, and at the end of the Sabbath. And finally, here is sheet music and tabs for another version of the melody, filtered through the traditional musical styles of England; it sounds like this. Perhaps someone could adapt this music to bring the lovely tune back to Rohatyn? This page is part of a series on Jewish Culture in Rohatyn and beyond. YIVO Archives: Rohatyn. Maariv service, along with Hebrew and Yiddish religious songs. 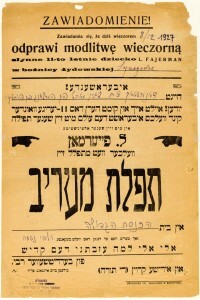 YIVO RG 28/P/786. Yizkor Book for Rohatyn: The Community of Rohatyn and Environs (Kehilat Rohatyn v’hasviva); eds. 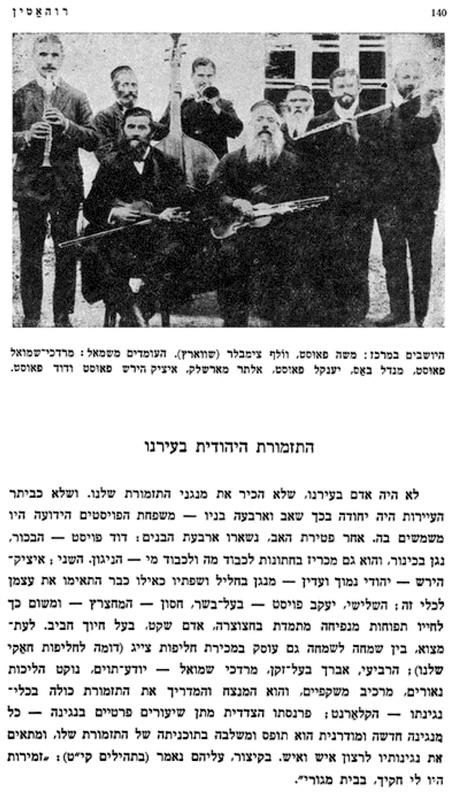 M. Amitai, David Stockfish, and Shmuel Bari; Rohatyn Association of Israel, 1962 (in Hebrew). Online image version hosted by the New York Public Library. Online English version hosted by JewishGen, coordinated by Michael J. Bohnen and Donia Gold Shwarzstein. The Book of Klezmer: The History, the Music, the Folklore; Yale Strom; Chicago Review Press; Chicago IL; 2011. Klezmer Music 1910~1942: Recordings from the YIVO Archives; Folkways Records album FSS 34021; compiled and annotated by Henry Sapoznik; Smithsonian Folkways; 1981. The YIVO Encyclopedia of Jews in Eastern Europe: Traditional and Instrumental Music. Ilana Cravits; Resources; Types of Klezmer Tunes. 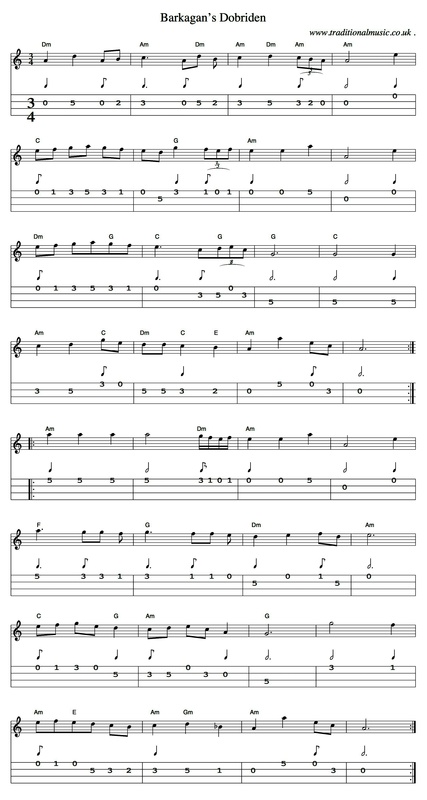 The Traditional Music Library; Sheet music and mandolin tab for Barkagan’s Dobriden.